The story of the missteps Hillary Clinton and her team made to lose the 2016 election. ...as revealing as those moments are, they inexplicably come in the book’s final pages and largely stand apart from the rest, which is mostly a dutiful recitation of every to and fro of the so-very-long, joyless, ugh-filled Clinton campaign. Who wants to relive the Democratic primary debates? Or read 20 pages each about the Iowa caucuses (she won, barely) and the New Hampshire primary (she lost, bigly)? ... Going first has its advantages — perhaps in sales and attention — but in this case the quick-fire version proves too limiting ... The world does not often clamor for a book about the losing presidential candidate, though Clinton may be the exception, given her celebrity and all the weighty questions for Democrats that still shroud her devastating loss. Those who have been fascinated with Hillary Clinton for the past quarter-century may want to add Shattered to their libraries. But those looking for some of those answers will want to look elsewhere. It is by no means the last word on 2016, but Allen and Parnes must be regarded as early front-runners in the race to make sense of it all ... There is no Big Reveal, no shocking secret answer. Instead we get a slow-building case against the concept and execution of the Clinton campaign, with plenty of fault falling squarely on the candidate herself ... The tone of the Allen-Parnes narrative is unsparing but not unsympathetic, noting campaign flaws and missteps without rue or recrimination ... Ultimately, Allen and Parnes get inside the campaign but not inside the mind of Hillary Clinton. Much the same seems to have been true for most of her staff and, ultimately, the voters. 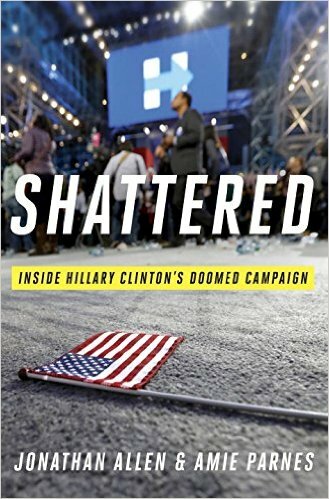 What did you think of Shattered: Inside Hillary Clinton's Doomed Campaign?